Time to terminate greenhouse emissions? Hollywood star and former Californian Governor Arnold Schwarzenegger says it’s time to act. A snapshot of our infographic, showing the big gap between pledged emissions cuts and achieving a 2℃ target. 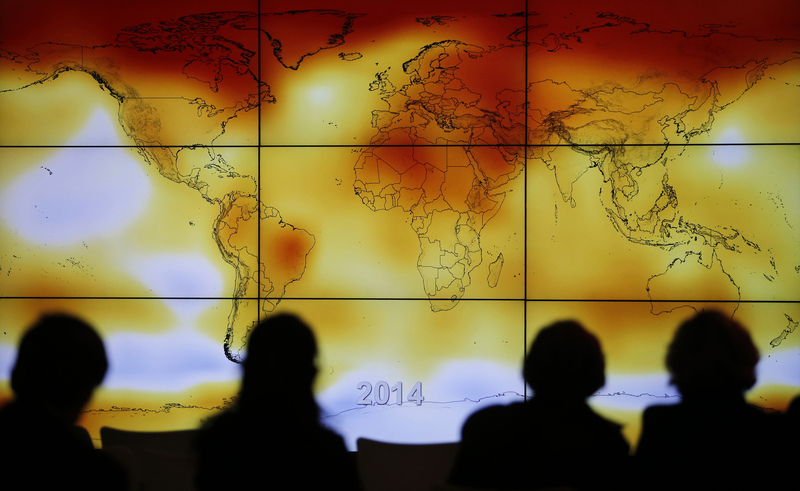 Paris summit attendees in silhouette in front of a screen showing a global climate anomalies. Talk is cheap, especially if it’s not backed up with serious funding. Campaigners and those representing poorer nations kept the pressure on right to the end. COP21: one of the few places where your work is scrutinised by a giant animatronic polar bear. Last week 12 Australian companies committed to strong measures to tackle climate change at the Australian Climate Leadership Summit in Sydney. Many of these companies are household names, including the National Australia Bank, Westpac, AGL and Origin. The announcement followed the peak bodies’ statement in June pledging their support to the global goal of limiting climate change to less than 2°C above pre-industrial levels, and acknowledging that this will require most countries, including Australia, eventually to reduce net emissions to zero or below. The commitment by these companies is consistent with ClimateWorks Australia’s research with ANU and CSIRO that shows Australia can substantially reduce greenhouse gas emissions – to net zero by 2050 – while still growing the economy. These announcements signal the momentum of business action on climate change is increasing in the lead-up to the Paris conference. It also sends a signal to the Australian Government that even greater emissions reductions are possible. In Australia and around the world, many businesses are adapting to the challenges of climate change and moving towards a low carbon economy. These businesses are making the shift from seeing climate change mitigation as a cost, to seeing it as an opportunity. Partly this is been driven by businesses wanting to mitigate risk, rising energy costs and respond to stakeholders’ concerns about climate change. Yet, the Paris climate process has also been a catalyst for many new groups of businesses taking action. One such action group, We Mean Business started just 14 months ago asking businesses to sign up to its seven pledges including adopting a science-based target, putting a price on carbon, and purchasing 100% of electricity from renewable sources. To date, over 250 companies and 144 investors have signed up to more than 600 commitments to tackle climate change. These companies represent US$5.7 trillion in total revenue and US$19.5 trillion in assets under management. About 40 Australian companies have signed on to key climate commitments, including Australia’s largest energy retailer, Origin Energy, which signed up to all seven of the commitments. Over 20 large multinational companies including Goldman Sachs, H&M, IKEA, Nike, Mars, Nestle, Unilever and Swiss have joined the RE100 initiative and have committed to going 100% renewable. Pledges are compiled by the United Nations’ NAZCA platform, which registers all commitments to climate action by companies, cities, subnational regions and investors to address climate change. To date, more than 900 cities, 100 regions, 1,700 companies and 400 investors around the world have pledged over 6,500 commitments to reduce emissions. In a similar vein, a group of international business leaders, running some of the world’s largest companies, established The B Team to push for a better way of doing business that takes account of the wellbeing of people and the planet. The organisation recently called on governments to commit to a global goal of net zero emissions by 2050 and will shortly be announcing companies pledging to be net zero companies. Progressive companies have begun setting ambitious emissions reduction targets, reporting emissions and shifting to low carbon technologies. Others are turning ideas into reality and delivering practical solutions on the ground. For example, construction company SOM sculptured the 309-metre-tall Pearl River Tower in China so it directs wind to in-built turbines that generate energy for the building. Car and battery company Tesla is set on developing a mass market for electric vehicles. There is already a solar plane travelling around the world. Energy giant AGL announced it will close down its coal-fired power stations in 2050 (still too slow but a strong first step from the sector), Shell is stopping drilling for oil in the Artic, and Australia’s major banks are also making overarching commitments to limit global warming to 2℃. There is no doubt the momentum is building for businesses to go “green”. So too is the ability to do it, thanks to rapid advancements in technology. Businesses are putting themselves in the spotlight and willing to be held accountable to their shareholders for their environmental management. However, Australia cannot just rely on business action if we are to achieve the substantial emissions reductions needed to avoid dangerous climate change. Leading businesses are making these pledges in good faith but they are only voluntary and not yet universal. In addition, practical measures being adopted by businesses to reduce emissions are still in the early stages and there needs to be an acceleration of actions to reach even our 2030 emissions reduction target. 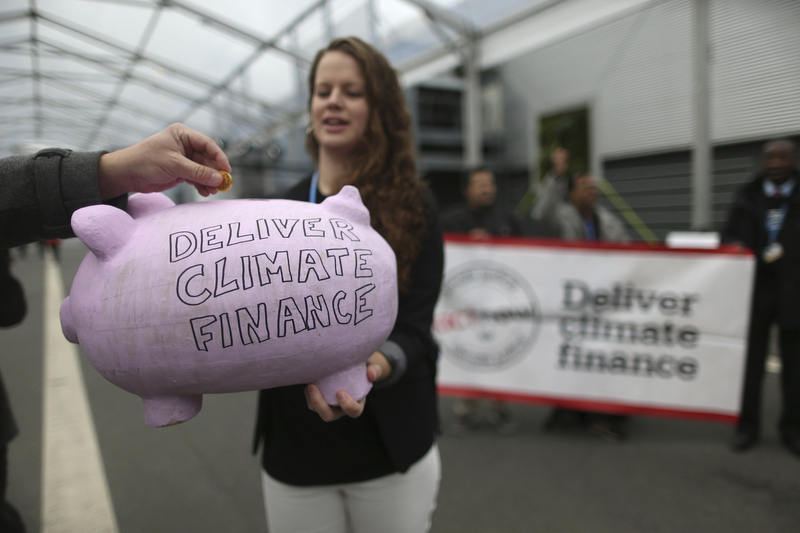 To beat the ticking carbon budget clock, the pace of business progress needs a policy nudge. A suite of policy and regulation is still needed to accelerate business efforts and ensure broad coverage of emissions reductions across the entire economy. The real contribution these pledges can make is to show the Australian government what can be achieved. The ramping up of business action on climate change should give the government confidence it can achieve more emissions reductions and set policies that aim considerably higher than the current targets. 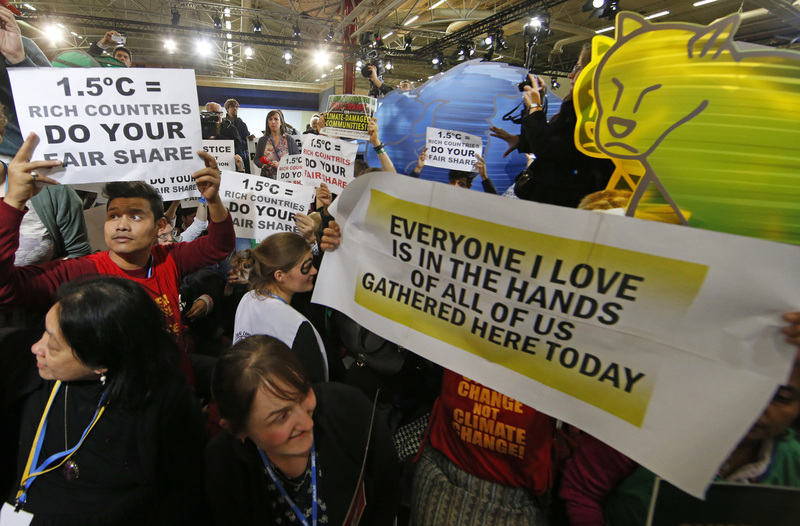 Will the Paris agreement be legally binding? The inability of previous climate summits, notably Copenhagen in 2009, to deliver a legally binding agreement led some people to declare those negotiations a failure. But in practice, this should not be the central criterion for gauging success. In Paris, the outcome should be judged on how far it goes towards supporting countries to scale up existing emissions reductions and stay within the agreed 2℃ global warming limit. It is not necessary that the agreement be legally binding, as long as the outcome establishes a process for achieving the necessary scale of action. At the Durban meeting in 2011, negotiators agreed to create “a protocol, another legal instrument or an agreed outcome with legal force” by the end of the Paris summit. This wording was deliberately chosen so as not to limit the options for how much legal force the agreement should carry. There is now a growing recognition that the outcome will be either entirely political, or a hybrid approach consisting of a legally binding agreement relating to process and conduct (such as provisions on scaling up the mitigation pledges), but in which countries’ emissions targets themselves are non-binding. While a comprehensive treaty may seem ideal, in practice there is no necessary connection between the legally binding nature of an international agreement and its effectiveness in producing outcomes. Legally binding treaties tend to encourage countries to make modest commitments in order to minimise their risk of non-compliance, or else to opt out entirely. The Kyoto Protocol was internationally binding but this came at a cost of reduced participation (the United States did not ratify it) and ambition (Australia’s Kyoto target, for example, actually allowed it to increase emissions, while developing nations were not given any emissions restrictions at all). Ultimately, political will and state action are what makes an international deal effective, so the outcome in Paris should provide a basic framework that will support countries to scale up the emission reductions that they are already making, so that we can achieve the 2℃ goal as efficiently as possible. Unlike the highly prescriptive Kyoto Protocol, the approach adopted in the run-up to Paris gives countries more freedom to choose their own climate targets (or in UN-speak, their Intended Nationally Determined Contributions, or INDCs) and to outline how they plan to meet them. While not legally binding, INDCs are publicly available, so countries are accountable not only to other states but to a wide range of domestic and international stakeholders. 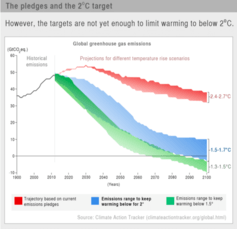 This is likely to lead to a more ambitious outcome in Paris, not least because the pledges are not “locked in” as they were under the Kyoto Protocol but are intended to be reviewed at regular intervals (the United States has suggested every five years), with the aim of ratcheting them up until the 2℃ goal can be met. For this approach to succeed, however, the INDCs need to be underpinned by a core set of rules, preferably embodied in a legally binding agreement, or at least in decisions made by consensus by the Parties. These should cover processes for scaling up pledges, as well as procedures for monitoring, reporting and verifying countries’ progress towards their targets. At a minimum, the rules should also make it clear what industry sectors and greenhouse gases are included in a country’s climate pledge; the policies and laws it has passed (or intends to pass) to deliver it; and whether it proposes to use mechanisms such as international carbon trading. The new approach puts a much greater focus on mitigation within countries. As a result, the Paris outcome is unlikely to establish any new market mechanisms, as the Kyoto Protocol did. Yet many developing countries’ INDCs state that their emissions pledges are dependent on buyers of international offsets from projects in their country. Carbon markets will need to play a central role in transitioning the global economy, and the expansion of these key carbon markets will increasingly be led by alliances and “clubs” of willing countries and organisations, rather than being enshrined in UN protocols. One such alliance that has already emerged is the Carbon Pricing Leadership Coalition, which includes the World Bank, the International Monetary Fund, and global leaders such as German chancellor Angela Merkel. We are entering a new era of international climate cooperation. It may be less legally standardised than the Kyoto era, but it is also likely to be more effective. At the world’s last “blockbuster” climate summit, in Copenhagen in 2009, the person in the president’s chair was former EU climate commissioner and Danish environment minister Connie Hedegaard. As someone who has led many important international efforts to reduce the risks of climate change but who also presided over what many felt was a frustrating result in Copenhagen, she has a unique perspective on the hype and hopes for December’s crunch climate summit in Paris. The Sydney Democracy Network invited her to a discussion where she engaged with participants including the new chief executive of the Investor Group on Climate Change, Emma Herd, Clean Energy Finance Corporation chair Jillian Broadbent and Climate Council chair Tim Flannery. The result was some key insights into what to expect when world leaders converge on Paris. You can read the full transcript of the discussion here. The dynamics ahead of the Paris meeting are auspicious – but nothing is certain. Bear in mind that the dynamics before Copenhagen seemed just right too: Al Gore had raised public awareness; heads of state were engaged; reducing emissions was seen as more than a purely environmental problem; and the world had witnessed the effects of Hurricane Katrina, the Australian drought and the 2003 European heatwave. Yet what emerged from Copenhagen was well short of an international treaty or an agreed set of rules committed to by all nations. I think that there are better chances, and there are also many lessons learned … we have China and the United States now playing ball. It means a lot … though we should not underestimate what will happen if developing countries and low-lying island states really start to question how sure they can be, for instance, that the United States under a new administration will actually deliver on its pledges. … we should not underestimate that there are still many unresolved issues at the table. We saw at Copenhagen that you can have a lot of people who have an understanding among themselves, but then the summit opens and all sorts of parties suddenly have all sorts of claims. So let’s just say we aren’t home safe yet with Paris. 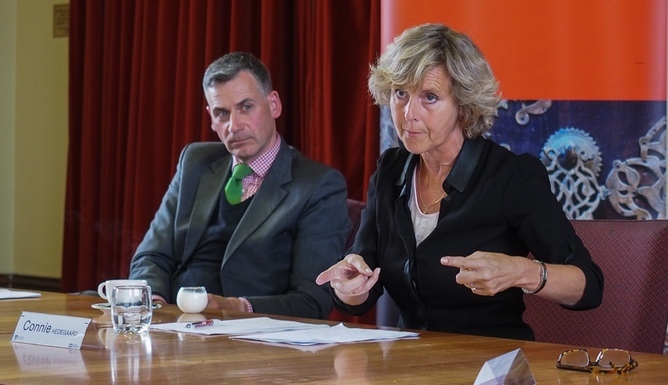 Hedegaard stressed that the implications of any new climate agreement need to be rapidly and effectively communicated to the public, including details of the economic and employment benefits. I understand in the United States, when they really started to calculate the health costs, that changed things. The French are absolutely fearful of having expectations set too high. The only problem is that it doesn’t work the other way round: if expectations are low then you are guaranteed limited success. There is a danger that even if Paris achieves significant progress, a lazy media will focus solely on whether the outcome will keep global warming within the vital two-degree threshold, with the result that the summit will be reported as either outright success or unmitigated failure. Here the lessons from 2009 are fresh in Hedegaard’s mind. Back then, when forced to respond to the “Climategate” accusations, the Intergovernmental Panel on Climate Change did not even employ a communications team. This time around, it should be different. Prime Minister Tony Abbott’s public statements on coal and wind turbines, and his government’s efforts to undo policies designed to encourage low-emissions technologies, have led to predictions that Australia will be a pariah at the talks. But Hedegaard says Australia’s climate ambition is still difficult to assess. I think the French inclination would be to say ‘thank you, Australia for finally doing something’. Because they know that without all developed countries delivering at least something, then there is less a chance of developing countries coming forward with anything. There is an enormous amount at stake; another failure wouldn’t simply be a case of going back to the drawing board. If it delivers another underwhelming result, questions will be asked about whether the UN negotiating progress can continue in the same way it has for the past 21 years. …it does have to deliver tangible progress. If there is not tangible progress, there will still be lots of climate summits in the future but ministers will stop coming, the top people will not attend, the air will go out of it. If Paris flopped, then you would see a very different kind of debate globally and in Europe … The risks are real and it’s not the case that if Paris fails then things will just continue with “business as usual” – our response could go backwards. I think Paris will probably deliver, but if it doesn’t, I fear that we will see a radicalisation. I see some citizens, young people, are getting impatient. Unless the world community comes up in Paris with a credible narrative about how we are changing track now, also with our economy and our finances, you will see sort of the old debate from the 1970s: anti-growth, anti-capitalism. What some of us have being trying to do is to say, no, we should work with business, we should work with our societies as they are and try to get this transition done. Because if we don’t we will have an anti-growth dichotomy and then people will stand there screaming in each of their corners and not much will happen. So there is really a lot at stake in Paris. In news that has delighted the ears of climate change sceptics the world over, the Copenhagen summit on climate change has failed to deliver anything of real value that will actually make a difference. It is truly disappointing that even in the face of a massive environmental disaster that will affect the entire planet, global leaders have failed to lead and work together in finding solutions to the major issues we face over the coming decades and century. Newspapers in Australia have reported the failure of the summit and are reporting on the leader of the opposition gloating over the failure of the summit. His solution is to ignore the real issue and hope that the Australian people prove to be as oblivious to climate change as the coalition he leads. Typically, the usual anti-Kevin Rudd biased journalists and climate change sceptics of the newspaper (The Sunday Telegraph) I read this morning, were also quick to pour further scorn on the Prime Minister and the problem of climate change itself (which they deny). One particular vocal climate change sceptic in the Sunday Telegraph has very little credibility with me and I find his obsessive anti-Rudd tirades more than a little tiring. This self-opinionated buffoon is little more than an embarrassment for both the Sunday Telegraph and the Daily Telegraph for which he also writes. His columns are becoming more of a personal vendetta against Kevin Rudd than anything resembling real journalism.